It has been 13 years since Should's last album proper, the complex shoegaze/postrock haze of 1998's Feed Like Fishes. While much time has passed, the core elements of Should have not wavered: the ultra-sweet male/female vocal melodies, the penchant for the unexpected, and the search for beauty in the minimal. The band's third album, Like a Fire Without Sound, infuses the pop sensibilities of Eno and Yo La Tengo while maintaining the personal eccentricities and atmospheric flourishes that define Should. Like a Fire Without Sound was conceived and recorded over a five-year period, and infuses idiosyncratic indie flair with pleasing pop sensibilities. Bookended by Eno-esque tributes "Glasshouse" and "The Great Pretend," the hook-laden record is simultaneously spacious and intimate. Eschewing the fashionable trend of burying production in cavernous lo-fi reverb and fuzz, Like a Fire Without Sound is not warmed-over 1990s-era Should. The layers of fuzzed guitar have been peeled back and the pop quotient is dialed up considerably, aiming instead to balance the twin peaks of soundcraft and songcraft. Like a Fire Without Sound is the unwavering soundtrack to daydreams of life's losses and loves. 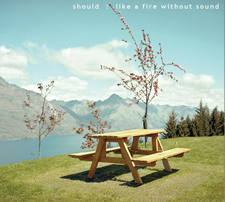 Like a Fire Without Sound was released April 26, 2011 on Words On Music.